The Bertsche iJet is a High Pressure Water Jet cleaning CNC machine capable of cleaning and removing chips in high volume applications. Critical features such as cross drilled, ID and OD holes require a versatile machine tool to clean these areas prior to post processing or assembly. 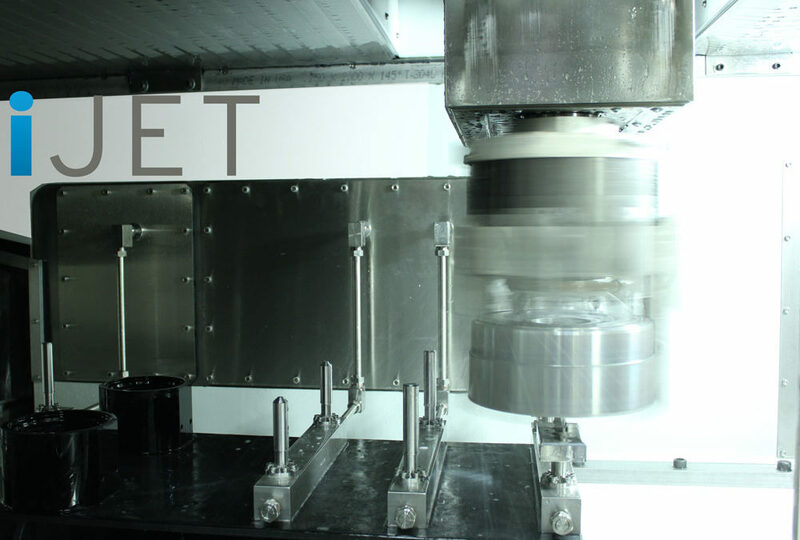 The next latest iJet is equipped with a set of C-Axis grippers capable of high RPM in order to quickly process all part features simultaneously and transport parts to each rigidly piped station. A part re-pick station has been integrated within the clean chamber to eliminate the need for part orientation prior to machine loading. Dual Grippers synchronously rotate at high RPM and have the capability to handle parts up to 9” in diameter. Direct part pickup eliminates additional fixture costs and reduces operator load/unload time. Quick change part nest with pallet identification – Easy change out between families of parts. Part type detection built into the part in out automation slide for automatic program selection and crash prevention. Re-pick station which eliminates the need for part orientation and helps reduce operator intervention. Rigid piping of all high pressure fittings and hoses allow for higher flows (up to 20 GPM) at high pressures (up to 20,000PSI). Higher flow allow us to incorporate additional cleaning stations leading to more flexibility to deal with complex features while processing parts in parallel. Integral high impact air dry station with centrifugal blower integral to the in/out feed slide which ensures parts are dry upon exiting the deburring machine.